I´m trying to understand which toner use the printer HP M201N. 83A or 83X. Whats the difference? Which is real a cartridge toner for this printer? 83X?, 83A? Thank you for your question. Both of these cartridges are compatible with your printer model HP LaserJet Pro M201. The 83A is the standard cartridge which prints 1,500 pages based on a 5% coverage, and the 83x is High Capacity which prints around 2,200 pages based on 5% coverage. The HP LaserJet Pro M201n printer comes with built-in Ethernet networking, making it ideal for workgroups. It has a decent printing speed, paper capacity and print resolution, as well as having special security features. The HP LaserJet Pro M201n monochrome laser printer is compatible with Mac OS, Windows and Linux platforms. The black housed LaserJet Pro M-201n is a front loading monochrome laser printer that has a two-line LCD. It comes with energy features like HP auto on / off and security features when networking. This model comes with Ethernet and USB connectivity and is compatible with HP ePrint and Apple AirPrint, as well as being Mopria-certified. For paper handling, the HP LaserJet Pro M201n mono laser printer can hold up to 250 sheets, as well as having a 10-sheet priority feed and manual duplexer. The HP LaserJet M201n black and white printer is fast, printing up to 25 pages per minute at a maximum resolution of 4,800 x 600dpi. Users can also expect the speedy LaserJet Pro M-201n network-ready laser printer to print the first page in just 8 seconds. The paper tray on the HP LaserJet Pro M201n can handle a wide range of media, including cards, transparencies and labels, as well as various media sizes. The reliable HP M201n laser printer has a monthly duty cycle of up to 8,000 pages and a built-in memory of 125 MB. For frequent printing with the LaserJet M201n mono printer, it’s best to install the high yield HP 83X toner which lasts for up to 2,200 pages, compared to only 1,500 pages with the standard cartridge 83A. 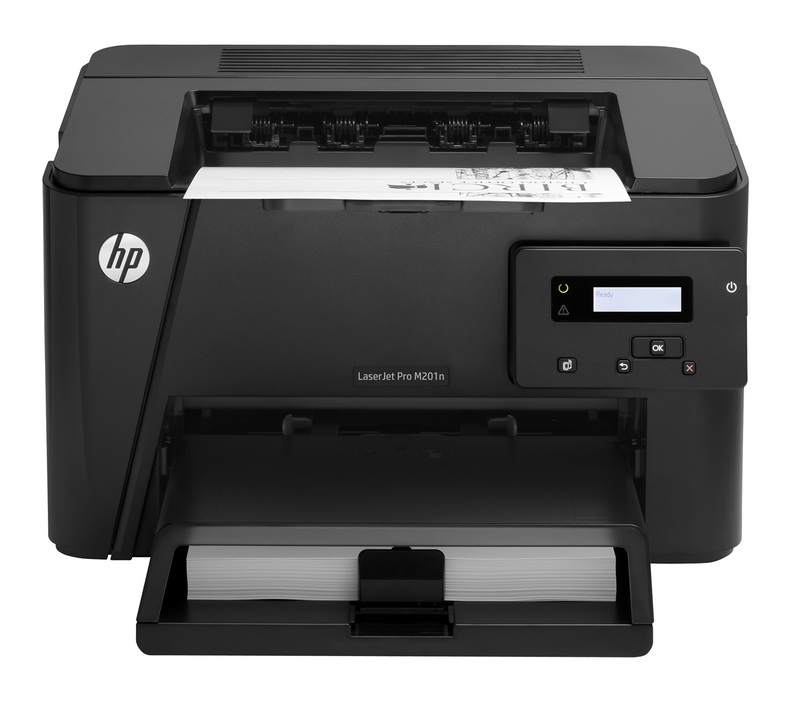 The Hewlett Packard LaserJet M201n A4 laser printer would be better if it had wireless connectivity. It would also be more productive with an automatic duplexer, rather than a manual one.